I made this custom handcrafted artisan clay tile, approximately 11″ x 9″, expressly for Hoot! — a gala event and auction to benefit Chimpanzee Sanctuary Northwest. 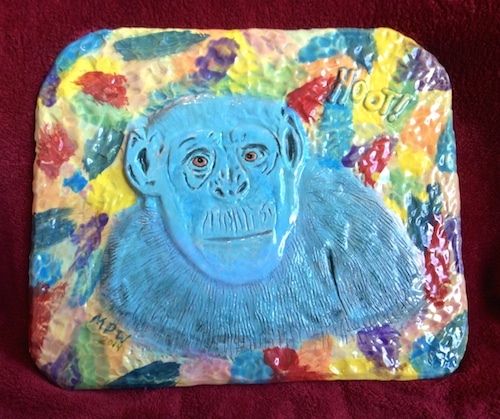 The tile features a head and shoulders carving of Foxie Chimpanzee (depicted in shades of teal) against a background of bold brush strokes in vivid colors, among which are hidden two images of Foxie’s beloved troll dolls.